Primal Scream will play the Planeta Terra Festival in Sao Paolo next weekend and Vic chooses that as his Scottish gig of the week. Full details on all the Scottish international gigs this week are below, along with Vic’s interesting thoughts on the Scotland’s Greatest Ever Guitarist issue. Vote this Wednesday. Ah, the Scream eh? What can I say that hasn’t been written before? Well, the last time I saw them live, having witnessed them many times before in either shambolic or outstanding form, they were on fire! That was back in March at the annual ‘South by South West’ music conference in Austin Texas, where they headlined the ‘Showcasing Scotland’ night at La Zona Rosa above Glasvegas, The Proclaimers, Camera Obscura, Dananananaykroyd and We Were Promised Jetpacks. I was compere, so had the thrill of introducing them onstage to a sold-out throng of Texan lunatics! The band and audience both seemed to love the show, and I thought they were as focused and tight as I’d ever seen them. By this point in a year of touring, 7 months later, they will quite possibly be drilled to perfection and razor-sharp… or out of their minds on chemical inspiration… Either way, they’re always a blast! Also on tour this week: Hudson Mohawke, Camera Obscura, Twin Atlantic, Travis, Lloyd Cole, Average White Band, Rustie, Malcolm Middleton and AC/DC. See all dates below. Vic has an interview with Jack White. Vic has Benbecula Records’ Christ in Session. As for Scotland’s Greatest Ever Guitarist, to choose 5 guitarists from Scotland’s rich and diverse musical history is incredibly difficult. It continually changes for me, and I agree with most of the other suggestions put forward so far. In order to keep people thinking and exploring, here is a list of 5 more for you to cherish. If you don’t know their work, go and explore… you have a treat in store! John McGeoch – He is an unsung hero and sadly only recognised and praised by spotters like me, or men and women of a certain age! John was a true original and pioneer with a unique style incorporating arpeggios and chorus/flanger effects with progressive lead lines and beautifully-controlled delay. Having played with Magazine, Siouxsie and the Banshess, Visage, The Armoury Show and Public Image Ltd, his CV speaks for itself. Johnny Marr and Jonny Greenwood are massive fans… so am I. RIP! Angus Young – Loved by millions, if not billions, around the globe and co-architect of the second biggest-selling LP of all time – AC/DC’s ‘Back in Black’ – Angus is quite often left off best guitarist lists or features low down in the polls. Unbelievable in my eyes! Alongside Jimi Hendrix, Jimmy Page and Tony Iommi, Angus is one of the greatest heavy blues/rock guitar players of all time – his touch is magic and instantly recognisable. I’m claiming him as one of ours! Robin Guthrie – Guitarist, co-writer and producer of the legendary Grangemouth outfit Cocteau Twins, Robin Guthrie is often side-lined by Elizabeth Fraser’s angelic vocals by critics and fans. However, without his 6-string soundscapes and effects-laden maelstrom of etheral wash (there’s some real music journo speak for you! ), there would be no songs, no sound and no band. He simultaneously invented a new way of playing and influenced generation after generation of indie, noise and shoegaze players up to the present day. He now makes instrumental albums that echo his past with the Cocteaus, but also look forward. Malcolm Ross – Having pioneered a sound that still rings true with bands across the world of Indie-Rock (Franz Ferdinand anyone? ), Malcolm has played over the years with Josef K, Orange Juice and Aztec Camera as well as various other projects, either solo or in collaboration. He invented a scratchy, white-funk technique that uses the tremolo arm to great effect and has a real romantc, melodic edge to it nowadays. Again, underated and unknown by many, he is an original and a guitarist who continually refines what he does and searches beyond the comfort-zone. Check his new LP with The Low Miffs for proof! James Yorkston – More contemporary than any other on the list, James is a member of the Fence Collective and has been releasing albums for years through the Domino label. Predominantly known as a song-writer, his guitar-playing really shines through on his recordings and when you see him live. He has developed a combination of Bert Jansch and John Fahey-influenced, folk-inflected finger-picking and World Music influences such as Madagascan virtuoso guitarist D’Gary. His roots in punk, indie and classic songs aren’t too far away either. The results are mesmerising, and you can start to hear his influence on other fledgling folkies in the scene. 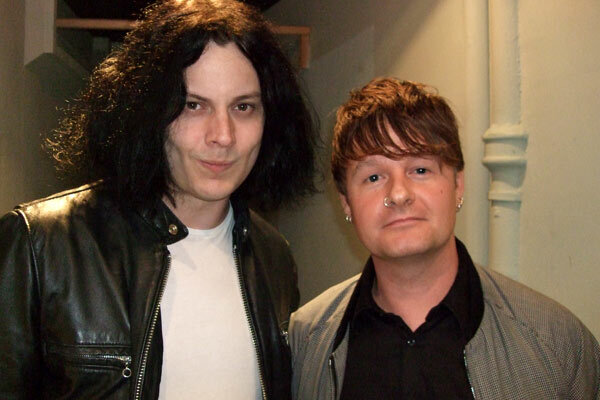 Listen to Vic’s interview with Jack White (White Stripes, The Raconteurs, Dead Weather) tonight on Radio Scotland.  Archived in Scotland on Tour with Vic Galloway, Music and tagged AC/DC, Average White Band, Camera Obscura, Christ, Hudson Mohawke, Jack White, Lloyd Cole, Primal Scream, Rustie, Scotland, Scotland on Tour, Scottish, Travis, Twin Atlantic, video. Bookmark the permalink. Why is there a photo of Vic Galloway and Sigorney Weaver?